Tech products help visually disabled, yet a long way to go! Why do sharp, witty lines from Dale Carnegie’s books cut the misty, morning breezes in Mitra Jyothi, a school for the visually challenged in Bengaluru? How did the author become a dramatis personae here, you wonder. Ratna, a volunteer, walks out from one of the audio rooms. She proudly says that textbooks, magazines, competitive exams, novels, fiction and biographies in Kannada, Hindi and English are converted into CDs, so that they can be documented and made accessible to visually challenged students. More than 4,000 audio books! It is obvious that advancement has been mostly a three-legged race of technology, speed and action. It seems to be the stated as well as unspoken objective of almost 15 to 20 schools for the blind in Bengaluru to not only make the differently challenged students independent and self-reliant, but also integrate them into the mainstream. Hence, the audio versions of the textbooks and general books are not only created, but also documented and regularly stored in their libraries. Interestingly, apart from the video support, devices including Braille embossers and tactile (connected to sensory touch) embossers result in the creation of books, diagrams and business cards. Screen reading software through JAWS and NVDA help to dispense training in computers and support employability. Great ideas – but only in the news! Other forms of technology recently hit the news, although they have still not reached the users in a big way. They do come with a promise – to support the visually challenged through small but significant devices. Last March, Eye-d, an AI-based app, was launched by the GingerMind Technologies. It is supported by a keypad that can be attached to smartphones and helps the user to decipher texts, understand the environment and the location. The originator of the innovation, Gaurav Mittal, has said that the marketing of his company is taken care of by just word of mouth and the media. Initially, the users are pretty happy to pay for the app, though the price has gone up. Still, it has to expand its user base. A recent invention that hit the headlines is Sparsh, a Dynamic Braille Board (dBB), which is an electro-mechanical technology reproducing content within electronic devices such as a smartphone or a computer. The braille reproduction is through a rolling display. The device routes the user to a special portal that would convert the text into braille and also sound. The Optical Character Recognition technology is said to immediately converts printed books into Braille. The software is about 94% to 98% accurate, according to the creator, A.G. Ramakrishnan, professor of Medical Intelligence & Language Engineering (MILE) at the Indian Institute of Science (IISc). However, all these are recent inventions, so they are bound to take time to catch on. So what is the most crucial requirement for the users? Lalitha’s answer seems apt and accurate, but is that not really about common sense and administrative improvement, rather than technological upgradation? Actually, she is clear that the need for text-to-voice technology is crucial today. Screen reading through JAWS and TalkSoft in smartphones has helped a lot in education and training of the blind. But better coordination and planning can make them more self-dependent, she points out. Does that mean that there are more challenges than facilities? She exclaims that while NGOs collaborate well, identifying and collaborating with each other’s facilities and support systems, authorities or companies who wish well do not really coordinate things properly. That, indeed, seems to be quite a tall order, pointing the arrow to what is required – technology to identify Needs! Despite the allegations of the government trying to delay BBMP polls, all the political parties claim to have started groundwork to face Bengaluru’s imminent city council elections. 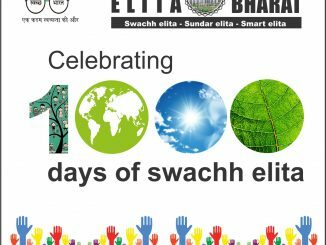 What can an apartment do in 1000 days, in its journey towards sustainable waste management? Here is what Elita Promenade did.